Based in Ash Grove, MO, Golden Scout Industrial, LLC makes each and every yo yo reel under the White’s Auto-Fisher and Mechanical Fisher brands. We take great pride in using quality products and put a level of quality into each step of manufacturing. We don’t cut corners and we are indeed MADE IN THE USA! We love to fish and hope you enjoy using your reels to catch fish as much as we like making them for you. If you catch something great (or just something at all) send us a picture of your catch through the website or our Facebook page. We love to see what you do with our reels. It was a simpler time back when John W. White Jr. first imagined White’s Auto Fisher. Arkansas had made it out of the Great Depression to have its son’s taken off to Europe to fight Nazi’s. On July 12, 1949 Mr. White, had submitted his patent for White’s Auto Fisher and by December 4, 1951 he had the promise to his future. He moved his base of operation from Pine Bluff, Arkansas to Little Rock, Arkansas in order to promote his product in an advanced city. From that time, Mr. White had operated White’s Auto Fisher across the nation, but more specifically his southern brothers. Rising out of Little Rock in the 60’s came Mr. White’s competition, the Mechanical Fisher. For three decades, these companies battled over fishers in the nation but more importantly, the fishers in their city. 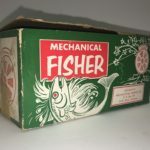 As a generation passed through the company of the Mechanical Fisher a new family came to own it. Andy and Joyce Anderson owned and operated the Mechanical Fisher in Little Rock for two years until something peculiar happened. Mr. White’s son sold White’s Auto Fisher to Andy and Joyce. 1994 was a big year for Andy and Joyce as they acquired White’s they also moved both companies to Diamond City, Arkansas. Once in Diamond City the company was known as the Rocking A ltd. The Rocking A continued to serve the southern fishermen yet their popularity grew throughout the nation and even to the rest of the globe. Companies from England, Italy, and Sweden had found the unique fishing/survival tool that had brewed in the Arkansas Delta for 50 years. 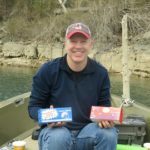 Beginning January 1, 2017 Mechanical Fisher and White’s Auto Fisher shifted ownership to Stuart Coutchie, Ozarks native and business owner. Stuart started his business, Golden Scout Industrial (which owns Griffin Industries metal stamping) in 2012 and wanted to continue the automatic reel legacy due to Andy and Joyce retiring. Growing up fishing on the streams and lakes of the Ozarks, Stuart recognized and appreciated the convenience and art behind the automatic reels. The reels are now produced on site on Historic Main Street in Ash Grove, Missouri, Stuart’s base of operations.